This blog is about British cheese, I eat huge amounts of British cheese and my fridge is usually groaning with the stuff. I’ve even had to start lurching about in front of an exercise video, such is my dedication to the stuff. But I have a confession to make. Every few weeks I scuttle off to the Italian delicatessen about ten minutes from where I live to buy an aged goat’s cheese from them. I don’t know what it’s called and neither do they (they seemed quite bemused when I asked them). But it’s lovely and I hadn’t found anything resembling it during my British cheese travels. But then, as the year rolled on through all the various cheese awards, I kept hearing about an aged goat gouda, which was hoovering up gongs left, right and centre. I asked its maker if it was available anywhere in the Big Smoke (it isn’t) and she very kindly sent me some to try. Here it is: Gouda Gold is a hard, pasteurised goat’s cheese made by Iona Hill at Ribblesdale Cheese in Hawes, North Yorkshire. The story of Ribblesdale Cheese started back in 1978 when Iain Hill and his wife Christine bought two goats (Victoria and Maude) and started making yoghurt and cheese. In 1982, Ribblesdale Goat’s Cheese was born. The business developed and the Hills started importing Dutch cheeses – including a gouda – to sell but in 2006 Iain fell ill and asked his accountant niece Iona to value the business. Unfortunately he passed away soon after but by then Iona had fallen for cheese in a big way and in 2007 she took over the business and decided to start making cheese again. 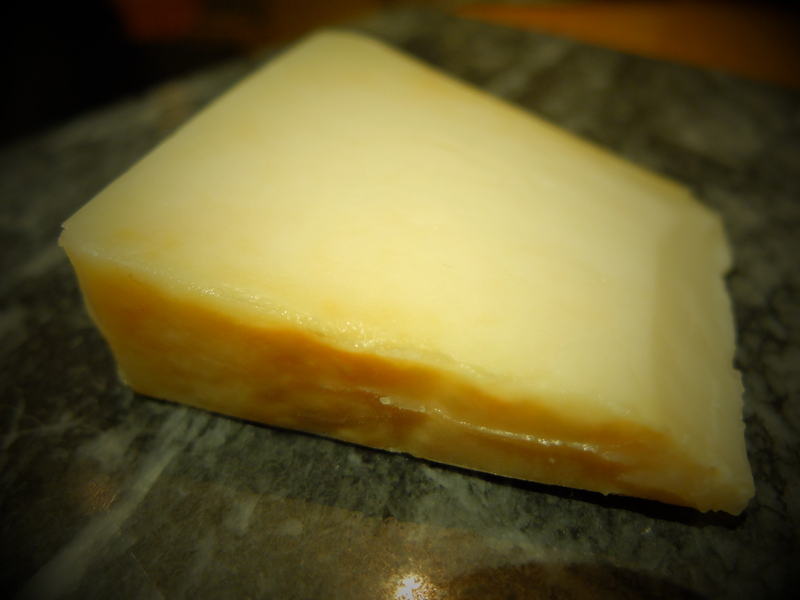 Gouda Gold is an aged gouda, wrapped in a cotton cloth and matured for at least six months on wooden slats. Legend has it that the product was developed as one of their younger goudas was left for too long but, when they tasted it, it was great. It was certainly a lucky oversight: production only started in 2014 but it has already won three gold stars at the Great Taste Awards, making it into the Top 50, against competition from 10,000 other speciality food and drink entries. It’s also the only goat gouda currently produced in the UK. Tasting it, it was easy to see why it’s been picking up plaudits. It’s rich and creamy but with a salty, slightly grainy texture – one of the judges compared it to a ‘soft Parmesan’, which sums it up nicely. It’s definitely a goat’s cheese but not offensively so (if you’re the sort of person offended by goat’s cheese). It’s ridiculously moreish and so I think the exercise video will be making an appearance later. I’d love to try an even more mature version of it too, having tried the gouda-esque cow’s milk cheese Old Winchester, which is matured for 18 months. I suspect 18-month-old Gouda Gold would be a world-beater (wipes dribble from mouth). With big thanks to Iona for sending me some of her cheese to try. Additional research from The Grocer and Great Taste Awards. I sure wish I could try this! Do they have any outlets in Wales?